Since Prince played Nice in France yesterday and followed up the show with an after party at the Palais club in Cannes, rumours have been circulating that the Minneapolis musician has plans to take over the Nice Jazz Festival. The annual event has been leaking money for some time, and it is known that the local authorities are anxious to rejuvenate it. An article in France’s Le Monde provides more details about Prince’s plans. According to Pascal Bernardin, who would be one of the partners in the project, Prince had spoken about the idea of running an artist-friendly festival already. He and his musicians are also big jazz fans. So the idea to put in a project grew from a series of meetings, leading to a formal submission recently. The idea of Prince acting as artistic director of a jazz festival is a nice one, no pun intended. However, there are a number of serious obstacles. First, there are other very serious competitors putting in tenders. Secondly, the town of Nice itself could complicate matters. It is known that they want to reduce the amount they put into the festival, while at the same time attracting larger profile artists and also reducing the ticket prices. This sounds almost impossible. Thirdly, there is also talk of moving the festival into the city centre, which would doubtless meet resistance from locals and shopkeepers. Fourthly, I can only guess at the sort of friction that could arise from a maverick talent such as Prince having to deal with the Nice local authorities. Lastly, the winning candidate would also have to contend with the Jazz à Antibes festival, a prestigious event that celebrated its 50th anniversary this year and is loved by musicians. In an unfortunate lack of foresight, it is held at the same time as Nice Jazz! Are there enough jazz fans in the south of France to support two side-by-side jazz festival at a distance of some 20 kms? The idea is certainly an interesting one. But whoever wins the day – and one can only hope that they will have some new ideas to inject into the jazz festival formula – will have quite a challenge. 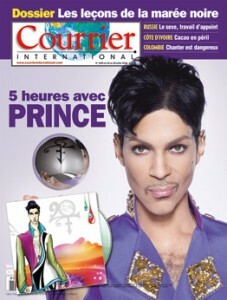 Prince fans might want to look out of the most recent issue of Le Courrier International, which features his latest album as a giveaway.